Hospitality is at the heart of Christian practice and we at St. Mary's enjoy celebrating with our community. We look to come together in various capacities throughout the year. Most of our favorite events revolve around food -- some are fundraisers, others are just for fun. No matter your faith (including those who profess no faith in particular), you are most welcome to join us in having fun! More information about our fellowship and fundraising events throughout the year can be found below. After the 10 am Sunday service, we gather for food and fellowship in Bentley Hall (adjacent to the church). Every week a couple, family or a group takes charge to provide food and beverages for those who have come to worship. It is a great way to catch up with friends on events of the past week, share plans for the next and to greet newcomers. As a way to spice up (literally!) our annual meeting in late January, we have a pot luck chili lunch prior to the start of the meeting. Some years, we have had up to eight different varieties and, of course, all the fixings are served alongside. 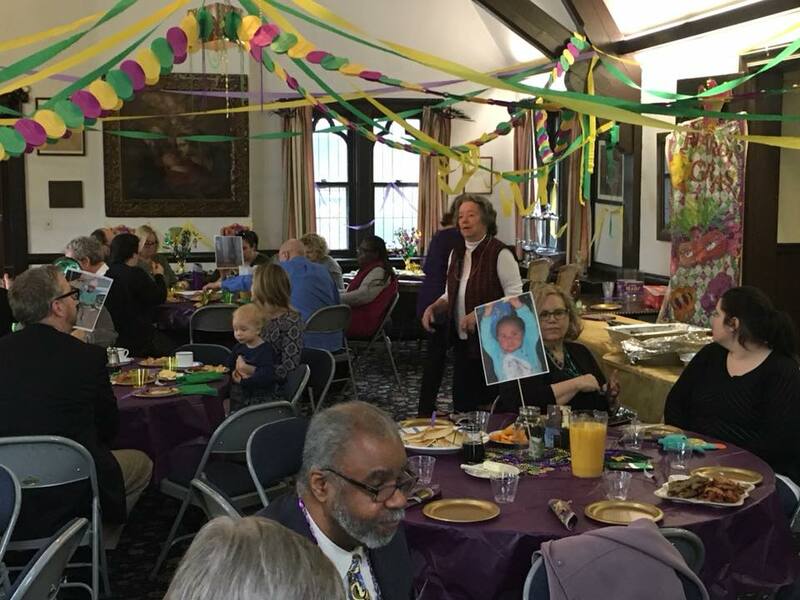 Hosted by a parish family and the Sunday school, this event takes place on the Sunday before Shrove Tuesday after the 10 am service and is a time to celebrate before Lent begins. The children festively decorate Bentley Hall and then serve as waiters for the meal. All of the "tips" the collect go to support Carryou, the focus of our international Outreach efforts. Once a month, a small group, led by a parishioner, gathers on a weekday in Bentley Hall to discuss the recent Day by Day devotional readings over a light lunch and their handiwork. Following the 10 am service on a Sunday in early July, we celebrate the arrival of summer by giving coffee hour a twist. 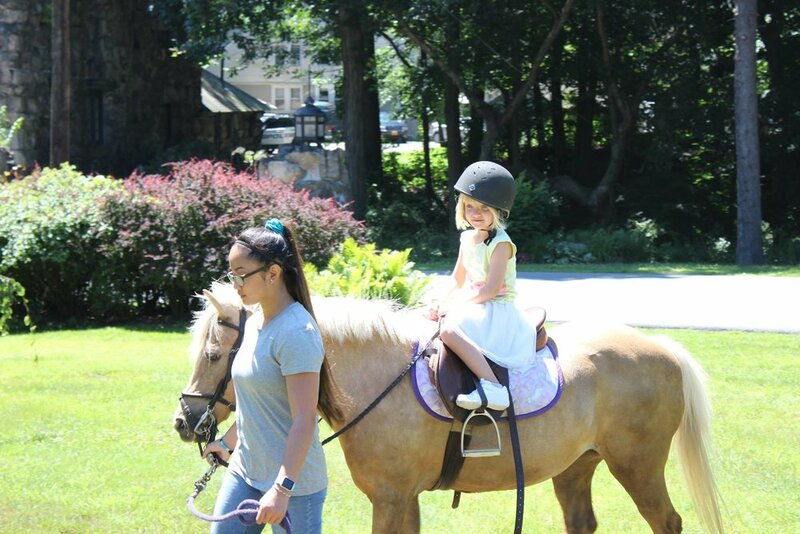 We serve ice cream and have pony rides and games for the children outside on our Great Lawn. Father Rick and Pete enjoy entertaining and are eager to share their home with parishioners and friends of St. Mary's. From small dinners to holiday open houses, events at the rectory typically include bountiful food and live music (from either the grand piano or the player piano Rick found in a barn and restored as a young man). A bi-annual event, this popular dinner draws people from the surrounding community to enjoy a night filled with fellowship to appreciate the historic architecture of Tuxedo Park up close. The Progressive Dinner begins with everyone enjoying cocktails and hors d’oeuvres together. We then divide up into smaller groups to enjoy entrées at about twelve other houses, and then rejoin at a third location for dessert. Alternating bi-annually with the Progressive Dinner, this is our other our major fundraising event, and it has become a wonderful way to share the beauty of our sanctuary with the wider community. We remove all the pews in the Nave and have a beautiful, candlelight dinner catered by a superb local chef. Afterwards there is a lively and often highly contested auction of donated items. During the spring or summer, St. Mary’s holds a bike ride around Tuxedo Park’s three lakes in an effort to raise money for various capital projects. Families with children are encouraged to attend and walk/ride a shorter route. It is a spectacular way to take in the breathtaking environs of Tuxedo Park. At times, we have partnered with the local Boy Scout Troop to organize a Bike Rodeo following the ride’s completion. A community cocktail party at the Tuxedo Club Boathouse to celebrate summer. We enjoy a warm June evening filled with laughter and live music provided by local musicians. Have a new fellowship or fundraising idea? Please contact us and help us make it happen.